Young British actor Jack O’Connell certainly seems to be handpicked by Oscar winner female actresses turned directors to star in their films. First it was O’Connell’s brilliant portrayal of Olympic athlete Louis Zamperini turned prisoner of war in the World War two epic Unbroken directed by Angelina Jolie and now he is cast as the disgruntled young investor Kyle Budwell in Jodie Foster’s live action hostage drama, Money Monster set on Wall Street, New York city. 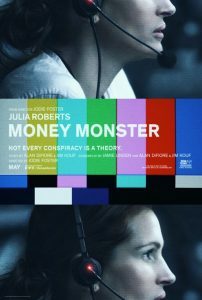 Echoing a similar vibe to the brilliant Spike Lee film, Inside Man, in which Jodie Foster starred, Money Monster is a gripping tale of TV show which is taken hostage by the unhinged yet scared Budwell, who holds the show’s vain TV host Lee Gates hostage. Gates is wonderfully played by Oscar winner George Clooney (Syriana) who literally has to put his life in the hands of the Money Monster show producer Patty Fenn, a sharp and sassy performance by Oscar winner Julia Roberts. 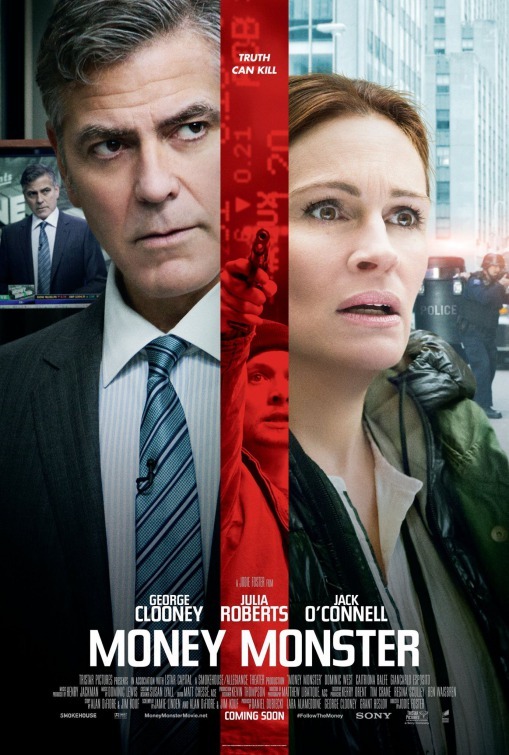 The fact that Money Monster has Julia Roberts and George Clooney as the two main leads is testament to the film’s star power yet rising star Jack O’Connell holds his own as the desperate and slightly idiotic Budwell who has literally bitten off more than he can chew, when he creates a live hostage drama so that the show, Money Monster can ascertain the real truth behind an investment company Ibis mysteriously losing $800 million which is initially blamed on a glitch due to a trading algorithm. As Money Monster develops, it soon emerges, that the slimy CEO of the murky multi-national Ibis, Walt Camby wonderfully played by Dominic West, last seen in the brilliant series The Affair, has done some dodgy stock manipulation as well as orchestrating some labour unrest at a platinum mine in South Africa. No surprise there. 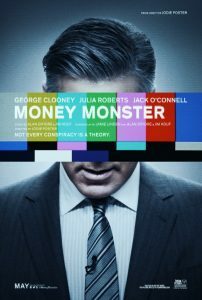 Money Monster is a taut, watchable thriller and whilst the plot is at times contrived, it is a fascinating indictment on the power of broadcast media especially in the public’s hunger to witness a dramatic spectacle unfold, made more pertinent as the conflict being televised relates to the incomprehensible world of international high finance, where a chosen few are entrusted with the financial futures of millions of shareholders in these precarious economic times. As a director Jodie Foster highlights the immediacy of Live Television while skilfully blending in the less than glamorous, but flawed characters behind the scenes which generate such flashy media content. Clooney and Roberts are particularly well cast as TV host and producer while O’Connell once again demonstrates that his star is on the rise. Money Monster is highly recommended viewing, extremely watchable, unpredictable and very entertaining.